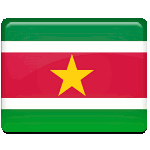 Suriname celebrates Emancipation Day on July 1 every year. This holiday is called Keti Koti, that can be translated as “the chains are cut”, meaning the end of the era of slavery in Suriname. The Netherlands administered Suriname for almost three hundred years. When Suriname became a leading exporter of cane-sugar to Europe, the Dutch brought there the slaves from Africa to work on cane plantations. Slavery was abolished by the Netherlands in 1863, however, the slaves had to work for another 10 years of transit period on plantations. They earned minimal pay and were not tortured any more. On July 1, 1873 slavery was totally abolished and many former slaves left the plantations for the city of Paramaribo, the capital of Suriname. The Surinamese often visit the church on Emancipation Day. Different events and activities are organized in the city parks. One of the most popular traditions is wearing of koto (for men) and kotmisse (for women). Since 2009 Keti Koti is also observed in the Netherlands. Various cities hosted events, making this day a national celebration and remembrance day throughout the country.